Alliteration aside, I have wondered for sometime why EMS in general has not adopted some of the scoring criteria for pulmonary embolism. Emergency medicine in general is very algorithm based and paramedics love algorithms. We are not doctors but we can act like them especially when we have a patient that we think might be having a PE. By utilized the 2 scores that we will discuss we can greatly improve patient treatment and continuing of care for our customers. This week we will discuss all things PE. Make sure you listen to the PE podcasts so that you get some more details about the pathophysiology, treatment, recognition and ECG findings in PE. There are many calculators to help you with this for example (Wells Criteria Calculator). What you are going to do is ask yourself and the patient these questions and score it. The traditional scoring method will lead you to prognostics. Generally if the score is >3 than PE might still be in the cards. Look for other things such as ECG findings to help you which we will discuss in another post. If the score is ❤ AND your gut feeling tells you that the probability is low you can move onto the next scoring method. If you assess your patient to have NONE of the above than you have essentially ruled out PE. A menumonic that I was taught in the past to remember this is HAD CLOTS: Hormone, Age >50, DVT/PE history, Coughing blood, Leg swelling, O2 >95%, Tachycardia 100+, Surgery/trauma <28 d.
Keeping this stuff in mind will help you manage your patient better and recognize treatment modalities and transport considerations. To STEMI or not to STEMI? A lot of people have asked me about calling STEMI alerts on patients. I know a lot of different departments have different protocols regarding the terminology of this practice such as “STEMI Alert” or “Cardiac Alert” or whatever. The fact remains, that all this talk you hear about “don’t call it unless you know for sure because it costs the hospital a billion dollars to activate the cath lab” is garbage. Embedded in the paramedic curriculum is, I will admit, more 12 lead education than before the “EMS Agenda for the Future” but nowhere near the level of what ER docs are expecting the bread and butter paramedic to be able to recite. I witnessed a doctor grilling a paramedic at one of my local hospitals because he didn’t know who to recognize Wellen’s on his 12 lead. Although I do understand the importance of this stuff, you can’t fault the paramedic for not initiated the alert or not initiated the alert based on the curriculum they have been taught. Until the EMS community and the national standards embrace the fact that our first responders are the ones who should be 12 lead experts, than paramedics are continuously mis-read the ECG. Do a test! Ask the nearest competent medic if they can recite Sgarbossa and see what happens. With that being said, JUST CALL IT! Keep the mindset “If it looks like V-Tach, treat it like V-Tach”. At this stage in the game don’t worry about differentiating pericarditis from Anterior Wall MI. Just call it! Always err on the side of patient safety. If you have telemetry…GREAT! Send it! If not use your best judgment. Transport your patient and learn from what you did. After your transport go home and study and read up on pericarditis and learn about the ECG differences. Next time you have that situation you will be more in tune with the call and act more accordingly. Now I know what some of you are saying..“Well what if it is a hemorrhagic tamponade causing signs of pericarditis and you treated with Aspirin because you didn’t know the difference”. I get it! What I am saying is if you ever have the question “Should I call a STEMI on this patient” roll through your head, just call it. Never go back to your station or post second saying “I should have done something else”. Act in the best interest of your patient and study for the next time. As EMS providers we SHOULD be 12 lead experts but this takes time and practice to the point of nausea. That is the purpose of this site and podcasts. It is to make us all better in what we do. Hello all! I sincerely apologize for being absent for so long but I have been extremely busy with my new job and some personal things going on in my life. But, I am going to start posting some material here in the next coming weeks.I am looking forward to getting this back up and running and I appreciate everyone’s patience. I am also going to be starting my podcasts again that should be available on Itunes shortly. Stay tuned…I promise it will be worth the wait. Hello all! The master Dr. Amal mattu uploaded this vide and I felt inclined to share it with you. Enjoy! This is a lecture we did on Respiratory for my medic students. It is gonna be a multi-part series and I hope you like it! The part where preload is addressed is incorrect. During normal negative pressure ventilation, preload actually increases as opposed to PPV where preload will decrease. LVEDP will decrease during negative pressure ventilation but the net effect is an overall decrease. Pressures in the right atrium and thoracic vena cava are very dependent on intrapleural pressure (Ppl ), which is the pressure within the thoracic space between the organs (lungs, heart, vena cava) and the chest wall. During inspiration, the chest wall expands and the diaphragm descends (see animated figure). This makes the Ppl become more negative, which leads to expansion of the lungs, cardiac chambers (right atrium [RA] and right ventricle [RV]), and the thoracic superior and inferior vena cava (SVC and IVC, respectively). This expansion causes the intravascular and intracardiac pressures (e.g., right atrial pressure) to fall. Because the pressure inside the cardiac chambers falls less than the Ppl, the transmural pressure (pressure inside the heart chamber minus the Ppl) increases, which leads to cardiac chamber expansion and an increase in cardiac preload and stroke volume through the Frank-Starling mechanism. Furthermore, as right atrial pressure falls during inspiration, the pressure gradient for venous return to the right ventricle increases. During expiration, the opposite occurs although the dynamics are such that the net effect of respiration is that increasing the rate and depth of ventilation facilitates venous return and ventricular stroke volume. The left side of the heart responds differently to the respiratory cycle. During inspiration, expansion of the lungs and pulmonary tissues causes pulmonary blood volume to increase, which transiently decreases the flow of blood from the lungs to the left atrium. Therefore, left ventricular filling actually decreases during inspiration. In contrast, during expiration, lung deflation causes flow to increase from the lungs to the left atrium, which increases left ventricular filling. The net effect of increased rate and depth of respiration, however, is an increase in left ventricular stroke volume and cardiac output. Ever since the first electrocardiogram (ECG) of an intact human heart was recorded with a mercury capillary (Lippmann’s) electrometer by Augustus Waller in 1887 (1,2), it is doubtful whether anyone could have envisioned the pivotal role that electrocardiography occupies in modern medicine. William Einthoven (1860 to 1927) is credited with the discovery of modern electrocardiography for which he was awarded the Nobel Prize for Physiology or Medicine in 1924 (2–4). Einthoven named the five electrical potentials in waves (PQRST) and developed the system of limb leads (I, II and III), which is still used today in determining the electrical axis of the heart. Sir Thomas Lewis (1881 to 1945), building on studies pioneered by Einthoven, advanced electrocardiography into the clinical arena (3,4). Lewis also made seminal contributions to the study of arrhythmias, especially atrial fibrillation and heart blocks (5). In 1934, Frank Norman Wilson (1890 to 1952) first described the use of unipolar leads V1 to V6 (where V is the symbol for ‘potential’) as having an exploring and a reference electrode (6). The Wilson Central Terminal is the reference electrode obtained through a resistive network, combining the limb electrodes. The Wilson Central Terminal is used as the reference electrode for the unipolar precordial and augmented leads. Emanuel Goldberger (1913 to 1994) introduced the augmented uniploar limb leads (aVR, aVL and aVF) in 1942, which began the era of the standard 12-lead ECG as we know it today (7–9). The augmented unipolar leads are of low electrical potential and are thus instrumentally augmented – hence the prefix ‘a’ (9). The reference electrode is the mean of the potentials sensed by two of the three limb electrodes, with the exploring electrode being excluded from the reference electrode (Table 1). Thus, lead aVR is the augmented unipolar right arm lead and may be considered as looking into the cavity of the heart from the right shoulder. It follows that all normally upright deflections on the ECG will, under normal circumstances, be negative in this lead (10). This makes aVR a valuable lead, which is discussed below. The lead aVR is oriented to ‘look’ at the right upper side of the heart, and can provide specific information about the right ventricle outflow tract and basal part of the septum (10). Because of its location and the fact that it displays reciprocal information covered by leads aVL, II, V5 and V6, lead aVR is often ignored, even when considering complex ECGs (11,12). Traditionally, the limb lead with the tallest R wave has been used to determine the electrical axis of the heart. Another method to determine the electrical axis of the heart involves seeking the lead with the deepest negative deflection or S wave. If aVR were noted to have the deepest S wave, it follows that the electrical axis should be directly opposite the hexiaxial reference system, ie, +30° (13). Studies by Engelen et al (14) found that in acute anterior myocardial infarction, the ECG is a useful tool to predict the likely left anterior descending coronary artery (LAD) occlusion site. They found that ST segment elevation in aVR strongly predicted LAD occlusion proximal to the first septal perforator (Figure 1). Yamaji et al (15) observed that aVR ST segment elevation greater than the ST segment elevation in V1 predicts acute left main coronary artery (LMCA) occlusion with a sensitivity of 81% and a specificity of 80% (Figure 2). This finding also predicts clinical outcomes. The authors also noted that the majority of published reports pertaining to LMCA occlusion, before their study, did not comment on lead aVR. Gaitonde et al (16) demonstrated in a prospective study that in acute myocardial infarction, patients with an ST segment elevation that is greater in lead aVR than in lead V1 prompted early angiography, withholding of clopidogrel and early referral to coronary artery bypass grafting, resulting in improved clinical outcomes. Kosuge et al (17,18) found that in patients with non-ST segment elevation myocardial infarction, ST segment elevation of 0.5 mm or greater in aVR was a useful predictor of LMCA or three-vessel coronary artery disease (sensitivity 78%, specificity 86%) (Figure 3). Furthermore, they found that aVR ST segment elevation was the strongest predictor of adverse events at 90 days in patients with non-ST segment elevation myocardial infarction. Barrabes et al (19), in a study of 775 patients with their first non-ST segment elevation myocardial infarction, showed that aVR ST segment elevation was associated with higher rates of in-hospital death, recurrent ischemia and heart failure. Kotoku et al (20) reported on the relationship between the ST segment level in lead aVR and the length of the LAD. ST segment levels (especially in leads II and V6), the site of LAD occlusion and the length of the LAD affect the ST segment level in lead aVR in patients with a first ST elevation acute anterior wall myocardial infarction. Proximal LAD occlusion is associated with ST segment elevation in lead aVR, while a long LAD occlusion is associated with ST segment depression in lead aVR. Kotoku et al (21) also reported that a prominent Q wave in lead –aVR in anterior wall acute myocardial infarction is related to severe regional wall motion abnormality in the apical and inferior regions, with an LAD wrapping around the apex. LMCA occlusion is another clinical situation in which prompt diagnosis by the clinician can help initiate life-saving invasive therapy. The typical electrocardiographic finding in patients with preserved flow through the LMCA is widespread ST segment depression maximally in leads V4 to V6, with inverted T waves and ST segment elevation in lead aVR (22). ST elevation in lead aVR, when accompanied by either anterior ST elevation or widespread ST segment depression, may indicate LMCA occlusion. Kanei et al (23) reported in a study of 106 patients that ST segment depression in lead aVR in inferior wall ST segment elevation myocardial infarction predicts left circumflex infarction or larger right coronary artery infarction involving a large posterolateral branch. In a study (24) of 142 patients with first anterior wall myocardial infarction, ST elevation in lead aVR, ST elevation in lead V3R of at least 1.5 mm and ST elevation in lead V1 of at least 2.0 mm were associated with the presence of a small conal branch not reaching the interventricular septum during anterior wall acute myocardial infarction. As discussed above, lead aVR can give invaluable clues regarding the level and extent of coronary occlusion, and help the angiographer plan his or her interventional approach. Furthermore, ST elevation in aVR is a strong predictor of in-hospital death and 90-day major adverse cardiac events. Lead aVR is valuable in stress testing because it represents electrical forces oriented toward the cavity of the heart. It has been shown that exercise-induced ST depression in V5 and concomitant ST elevation in aVR may detect significant left anterior descending coronary artery stenosis in patients with single-vessel disease (25). Another study (26) of more than 100 patients showed that exercise-induced ST segment elevation in lead aVR was useful in predicting LMCA disease (sensitivity 92.9%, specificity 48.6%). ST segment elevation in lead aVR during exercise testing was found to be more strongly correlated with positive tests such as nuclear imaging and coronary angiography, compared with right precordial lead changes (27). ST segment elevation in lead aVR is associated with a reversible defect in the anterior LAD territory regardless of the presense of ST segment depression in other leads (28). 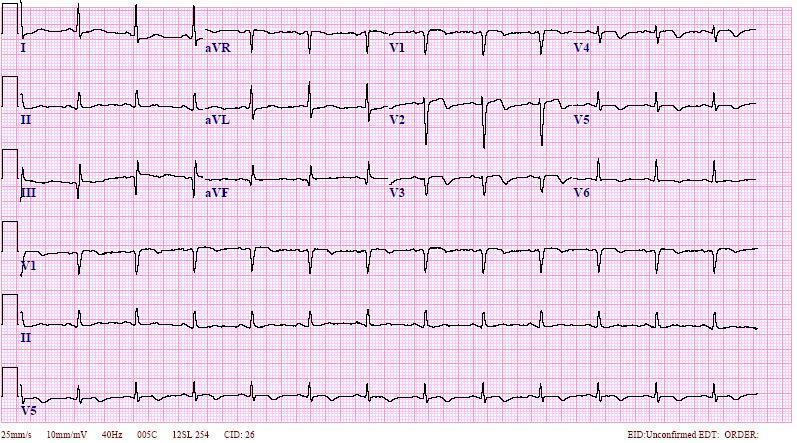 The ECG is frequently abnormal in cases of pericarditis, with diffuse ST segment elevations and PR segment depressions in most leads. Reciprocal ST segment depression and PR segment elevation (‘knuckle’ sign) in lead aVR are characteristic and help in supporting a diagnosis of acute pericarditis (Figure 4) (29,30). Acute pulmonary embolism distorts right heart hemodynamics and gives rise to a variety of ECG findings including the classic S1Q3T3 pattern (S wave in lead I, Q wave in lead III and T wave inversion in lead III). ST segment elevation in aVR is believed to be due to acute right ventricular overload, transient hypoxia from impaired coronary flow or increased myocardial oxygen demand (Figure 5) (31,32). The morphology of the P wave in lead aVR can be used to differentiate atrial tachyarrhythmias. A positive P wave in aVR during tachycardia favours atrioventricular nodal re-entry tachycardia (Figure 6) (11). A negative P wave in aVR suggests a focal right atrial tachycardia (Figure 7) (33). Ho et al (34) found that ST segment elevation in aVR during narrow QRS complex tachycardia suggests atrioventricular re-entry through an accessory pathway as the mechanism of the tachycardia. The morphology of the R wave in lead aVR has been used to risk-stratify patients with Brugada syndrome (35). In patients with Brugada syndrome, a prominent R wave in lead aVR – also known as the ‘aVR sign’ – portends a greater risk for arrhythmic events (Figure 8) (36). Overdose of tricyclic antidepressants is a leading cause of death in the United States (37). QRS duration is the cardiac parameter mostly followed in cases of tricyclic antidepressant overdose, because it has been shown that a QRS duration of 100 ms or greater is predictive of seizures and arrhythmias (38). Liebelt et al (39), in a study of 79 patients with tricyclic anti-depressant overdose, showed that the amplitude of the terminal R wave (3 mm or greater) in aVR and the ratio of the R wave to the S wave in aVR are better predictors of seizures and arrhythmias in these patients, than QRS interval (Figure 9 and Table 2) (39). With dextrocardia, the heart is situated in the right chest due to a primary reversal of the primitive cardiac loop (40). Here, the P wave, QRS complex and T wave are all directed inferiorly and to the right, and the ECG has an appearance of the arm leads being reversed (10,41). In both dextrocardia and lead reversal due to incorrect lead placement, the P wave and QRS complex are upright in lead aVR. In case of lead reversal, the precordial pattern (V1 to V6) is normal (Figures 10A, ​,1B1B and ​and1C).1C). With dextrocardia (Figure 10D), the QRS voltage gradually diminishes from V1 through V6 as the leads are placed further left away from the heart in the right chest. The postulated causes for electrocardiographic changes associated with tension pneumothorax include displacement of the heart, rotation of the heart, acute right ventricular dilation and air in the thoracic cavity (42,43). PR segment elevation in inferior ECG leads and PR segment depression in lead aVR have been reported in left-sided pneumothorax by Strizik and Forman (44). Stress-induced cardiomyopathy, also known as takotsubo or apical ballooning syndrome, has been reported to result in transient ST segment elevation in lead aVR, along with ST segment elevation in leads I, II, III, aVF and V2 to V6 (45,46). Reversible diffuse impairment of coronary microcirculation leading to transient global myocardial ischemia, possibly due to a catecholamine surge, is generally accepted as the mechanism producing this acute myocardial infarction picture (47). Warner et al (48) proposed new and improved electrocardiographic criteria for the diagnosis of left anterior hemiblock. They demonstrated a greater degree of accuracy in diagnosing left anterior hemiblock using criteria based on the fact that the peak of the terminal R wave in lead aVR occurs later than the peak of the terminal R wave in lead aVL, compared with using frontal plane QRS axis criteria (Figure 11). Lead aVR has multiple clinical applications and is a useful tool for interpreting ECGs. However, it is often overlooked, even by experienced ECG readers. Careful attention to this lead during evaluation of the ECG can aid in the diagnosis of acute LMCA or proximal LAD occlusion, affecting timing and type of therapy, and predicting prognosis in patients with acute myocardial infarction. Noting changes in aVR can aid in the diagnosis in clinical scenarios, including pulmonary embolism, tricyclic antidepressant overdose, dextrocardia and lead reversal. Clinical training curriculums need to impart the importance of systematic evaluation of all leads while interpreting the ECG. An interesting suggestion by Palhm et al (49) is to adopt an orderly, as opposed to classical, electrocardiographic limb lead display (Figure 12). They demonstrated that such a display results in greater diagnostic accuracy in less time. Nevertheless, aVR – the forgotten lead – can be a useful tool in the diagnosis and prognosis of many clinical syndromes. R-Wave Progression: Is it important? YOU BET!! “Why should I care about R wave progression, I am only a medic and I should only be able to diagnose STEMI”. These words pierce right through me like a knife. But, people only see what they know and if you don’t study this then you are going to potential miss some bad pathology. This is from Dr. Smith’s ECG blog. If you are not familiar with Dr. Smith, he is a leading expert on difficult ECG’s and a personnel idol of mine! STILL DON’T THINK IT’S IMPORTANT? Well keep reading baby birds. Before we start talking about “poor R-Wave progression”, you must first define what “normal” R-wave progression really is. 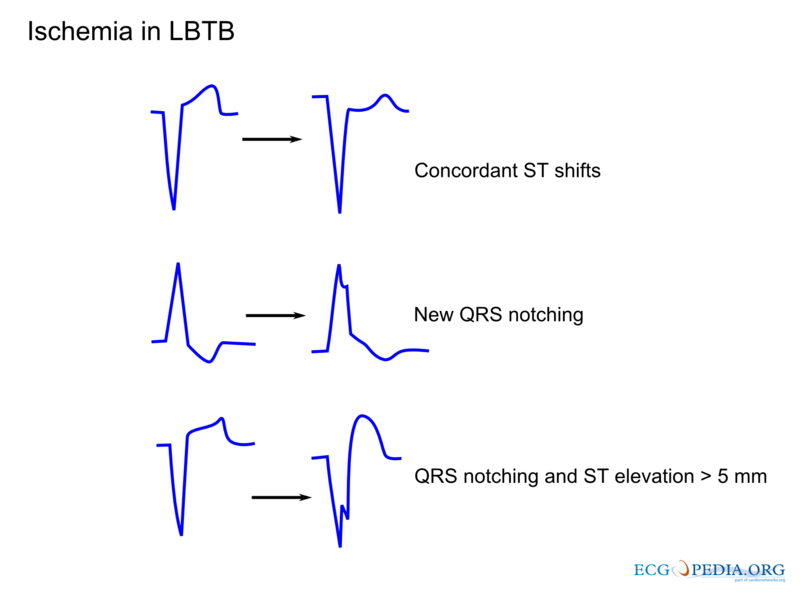 Normal R-wave progression is where normally, from lead V1 to lead V6, the pattern is that of a change from the S wave being prominent to the R wave being prominent. So when looking at V1 you should have a mostly downward deflecting axis and in V6 you should have a mostly upward inflecting QRS axis. We should also notice how rS complex in V1 SLOWLY “transitions” from negative to positive in V6. This “transition” is called; yup you guessed it, R wave transition. There should be a gradual transition from negative to positive. So which brings up the next question, what is “normal”? We must define set criteria for normal. In the literature, definitions of poor R-wave progression have been variable, using criteria such as R-wave less than 2-4 mm in leads V3 or V4 and/or the presence of reversed R-wave progression defined as R in V4 <R in V3 or R in V3 <R in V2 or R in V2 < R in V1, or any combination of these. So we can have either early progression or late progression. Now let’s look at some abnormal ECGs. This would be an example of late R wave progression. Biphasic T waves and deep Q’s in the inferior leads. This is an anterior wall MI. See the importance? Yet another old anterior MI!! See a pattern here? So what is the differential for poor R wave progression? Anterior MIHmmmmmmm! Does this seem important now? What is the above ECG? See delta waves? Loss of R wave progression? You guessed it! WPW. What about this one? Very late transition and RsR’ in V5. This is a LBBB. Knowledge is power. By learning the art of 12-lead we can better clinicians and instead of looking at that 80 year old female pt with your paramedic eyes and signing that refusal, you might be able to make a lot better judgment call on not just transporting but a lot where you are transporting to. My next post will be on tall R waves in lead V1 and stay tuned for my podcast on this topic just in case you hate reading. I have heard many times in the past this awful statement: “Why shouldI do a 12-lead, he has a paced rhythmand thus I can’t see an MI”. Well that is very inaccurate. We can use Sgarbossacriteria for determining MI in the presence of LBBBor paced rhythm. 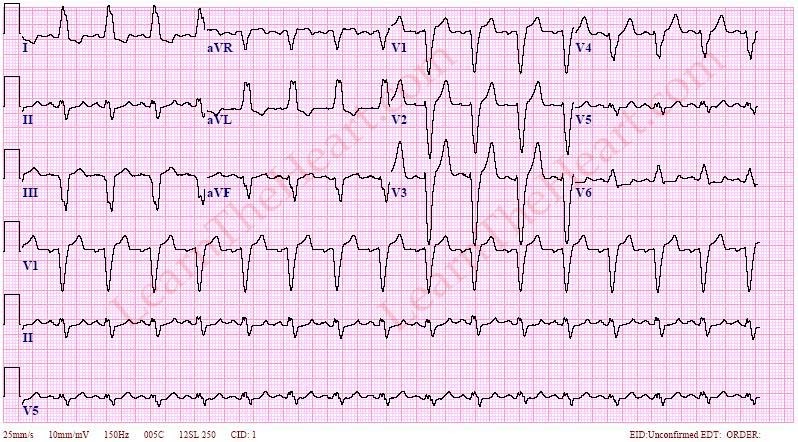 ST elevation > 5 mm in leads with a negative QRScomplex (inappropriate discordance in ST deviation) (score 2). This criteriais sensitive, but not specific for ischemia in LBBB. It is however associated with a worse prognosis, when present in LBBBduring ischemia. I understand that this holds very little weight as medics in the field, but knowledge is power and when teaching a 12 lead class this should be mandatory instruction. Here are some links to some videos that illustrate this.